Bring 2 medium pots of water to a boil over high heat. In 1 pot, cook pasta according to package directions, then rinse with hot water to ensure pasta doesn’t get sticky when left to stand. (NOTE: Hot water washes away the starch better than cold water. )Fluff pasta with your fingers or a fork to further de-clump noodles, then set aside. In the second pot of boiling water, add broccoli, cover, turn heat down to low and simmer for 5 minutes. Drain and set aside. Meanwhile, in a bowl, add coconut milk, tomato paste, peanut butter, ginger, garlic, pepper flakes and lime juice. Use a fork or whisk to thoroughly combine. Simmer coconut mixture, bell pepper and bean sprouts in a nonstick pan over medium-low heat for 5 minutes, stirring often to prevent clumping. Add shrimp and cook for another 2 minutes, then flip shrimp over and continue to cook for a final minute. 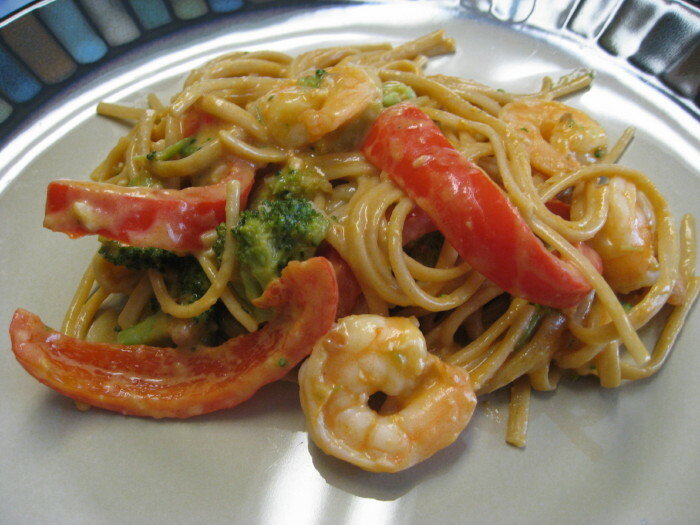 Toss noodles and broccoli with coconut-shrimp mixture and serve piping hot.